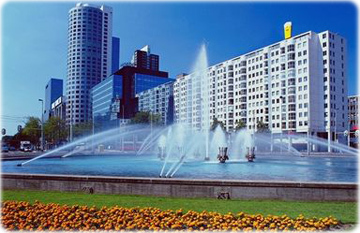 The Netherlands is a a country in northwestern Europe that faces the North Sea. It is is a constitutional monarchy with about 17 million people. The major rivers of The Netherlands are the Rhine, flowing from Germany, the Maas and the Schelde, flowing from Belgium. These rivers and their arms form the delta with its many islands. Together with numerous canals, the rivers give ships access to the interior of Europe. In the period of the Roman occupation, which lasted until the fourth century, the region was populated by Celtic and Germanic tribes. The Saxons settled in the east of the region of the future Netherlands and the Franks occupied the southern territories. After the fall of Napoleon, the independence of the Netherlands was restored in 1815 by the Congress of Vienna. 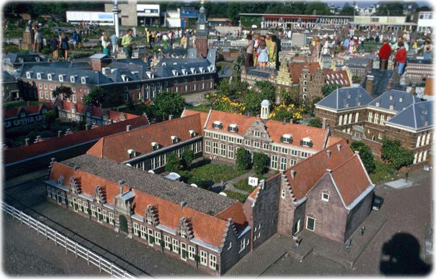 From about 1880 to 1914, The Netherlands enjoyed an era of economic expansion. The country was a founding member of the EU and participated in the introduction of the euro in 1999. In October 2010, the former Netherlands Antilles was dissolved and the three smallest islands - Bonaire, Sint Eustatius, and Saba - became special municipalities in the Netherlands administrative structure. The larger islands of Sint Maarten and Curacao joined the Netherlands and Aruba as constituent countries forming the Kingdom of the Netherlands. 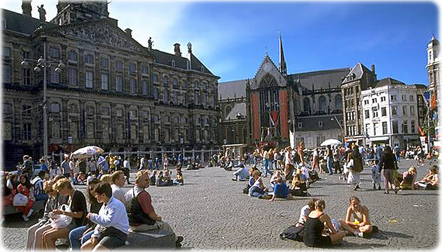 A historic square in Amsterdam, the capital of The Netherlands. Rotterdam, the second biggest city in The Netherlands (left).